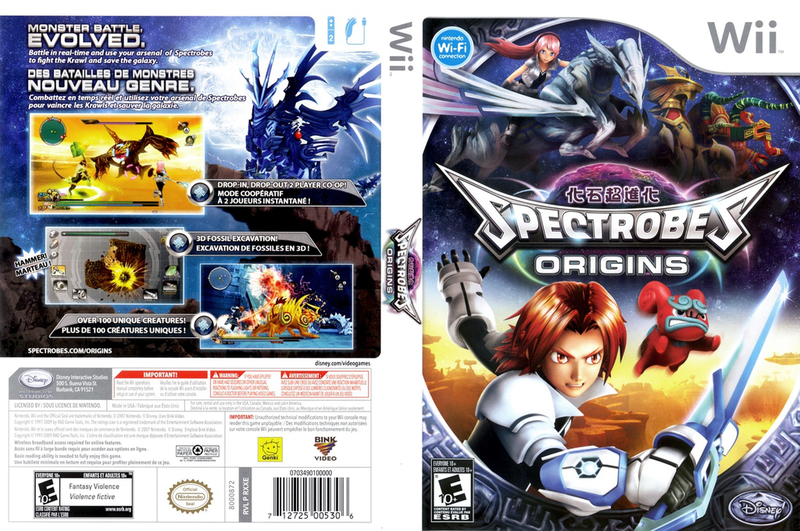 synopsis (EN) Disney Interactive Studios' original series that combines fossil excavation with a Pokémon-like RPG battle mechanic makes its Wii debut in Spectrobes: Origins. Gamers once again join protagonists Rallen and Jeena as they travel to exotic lands to excavate, train, and command a variety of elemental creatures known as Spectrobes. The baby Spectrobes must then be sent to an incubator so they can grow strong enough to help Rallen and Jeena battle the vicious "Krawl" creatures that have been terrorizing the galaxy. Excavation takes on the form of a Trauma Center-esque mini-game where players use their Wii Remote and Nunchuk to carve, blast, and chip the fossilized creatures out of their rocky encasements, with quicker and more precise cuts resulting in more powerful Spectrobes. Gamers can then enlist juvenile Spectrobes to help locate hidden items and fossils, while the "Adult" and "Evolved Form" Spectrobes hone their battle skills by engaging in real-time combat. Rallen and Jeena can bring as many as six Spectrobes with them into combat, while multiplayer fans can join a friend (in the form of a Spectrobe) for co-op battles. synopsis (ES) ¡Es hora de enfrentar de nuevo a los malvados Krawl que amenazan la galaxia! Con novedosos Spectrobes que extraer de la roca y devolver a la vida, un juego cooperativo para dos jugadores y un enrevesado argumento, Spectrobes Orígenes te llevará a una nueva dimensión de diversión.